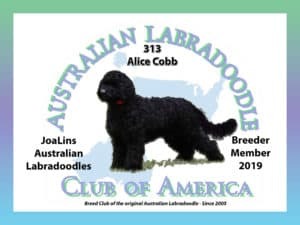 Thank you for deciding that a JoaLins multi-generational Australian Labradoodle puppy is right for you! Please fill out the application below. This routine questionnaire is common among breeders of quality Australian Labradoodles. The following questions are designed to help us to select a puppy that compliments your family and lifestyle and your preferences. We want to be sure that we place puppies in “forever” homes! Thank you for your interest and for taking the time to answer these questions. Which of these colors above is your #1 choice? When are you looking to bring a puppy into your home? Will your puppy be shipped or will you pick it up? If you work full time, will your puppy be alone all day? If yes, how will your puppy be cared for during working hours? Have you ever owned an Australian Labradoodle before? Do you have children under 8, adults over 75 or individuals with disabilities in your home? Does anyone in your home have dog related allergies or asthma? MOST IMPORTANT - What else you can share about your lifestyle or family that will help us find you the perfect puppy? I understand that each litter is unique. I also understand that the puppy selection will be done by Joalins in the order in which the deposits were received. I understand that while the physical traits selected on this puppy application form will be taken into consideration, the puppies will be matched based on personalities and lifestyle needs of each family. If I am not satisfied with the puppy chosen by JoaLins, I may choose to defer my deposit to a different litter. Finally, I understand that breeding dogs will be selected FIRST from each litter, based on traits that will further enhance the breed. I understand that JoaLins will send my puppy home on a spay/neuter contract. This means that JoaLins requires that this procedure be performed before the puppy’s 6-month birthday by a qualified veterinarian. I understand that I must send paperwork documenting that this procedure has been done from the veterinarian back to JoaLins. This is non-negotiable. I acknowledge that JoaLins has the right to refuse to sell to me at any time. I further understand that the $500 deposit will be applied towards the total cost of my puppy and is non-refundable, but may be transferred to a different litter within one year.